What makes Château Bouffémont an enviable base for Christmas corporate events? Christmas is a fine time to be at Château Bouffémont for more than one reason. The noble stone-built residence truly lives up to its reputation as a fairytale venue at this time of year, with the snow settling beautifully across its extensive manicured grounds and, on the inside, the fireplace crackling away amid the most refined decor. Such characteristics make it greatly unsurprising that the enchanting Château is so sought-after for Christmas parties and wonderful end-of-year celebrations; indeed, this is precisely why Château Bouffémont offers highly enticing festive-season break offers for those wishing to holiday here. However, given all of the inspiring winter activities that we do offer to those who stay over with us at Christmas time, it can be easy to forget that we do also continue to serve as a base for corporate events throughout the festive season. Here are some reasons to make the resplendent property your base for your own firm’s next Yuletide corporate event. The surroundings in which your company’s events take place do, however much one may wish otherwise, influence how your brand is perceived. Thankfully, Château Bouffémont exudes sophistication and heritage that will reflect extremely positively on your business, whatever the nature of your planned corporate event. From the fine fabrics and crystal chandeliers of these stunning event spaces to the extraordinary grounds that a sprinkling of snow simply serves to make an even more idyllic sight, everything about the backdrop that Château Bouffémont presents will be utterly inspiring and captivating for your guests. No corporate event venue can claim to be worthy of the name if it lacks the extensive transport connections that enable all of your guests to reach the site of your event safely. However, these attendees are also likely to appreciate a setting that feels like a true refuge from much of the ‘hustle and bustle’ of the wider world. Château Bouffémont offers both of these key advantages, its five acres of tranquil and well-maintained gardens belying its location a mere 30 kilometres from the centre of Paris. With Charles de Gaulle Airport also just 20 minutes away, your guests can be assured of arriving in good time in readiness for your event. As for if you and your attendees do manage to steal some free time away from your big corporate event itself, there’s no shortage of great things to do in Paris in December 2017, as outlined by the Paris Insiders Guide. Château Bouffémont consists of nine suites and rooms providing the broad assortment of facilities and full complement of staff that will help to make your corporate event a triumph. Whether your firm is planning a major product launch, team-building event, fashion show or any other corporate event – possibly based specifically on a Christmas theme – we will work diligently to provide a corporate-standard experience to you and all of your guests. We can offer no fewer than three conference rooms, for example, with sufficient capacity for 70 persons in plenary, 140 for seated dinners and 200 for cocktail dinners. The business equipment that we make available for use by our corporate clients and guests is also, as you would expect, impeccable. Wi-Fi, a projector, printer and scanner are all available, as is the experienced, skilled and professional staff team that can assist you in making the most of them. 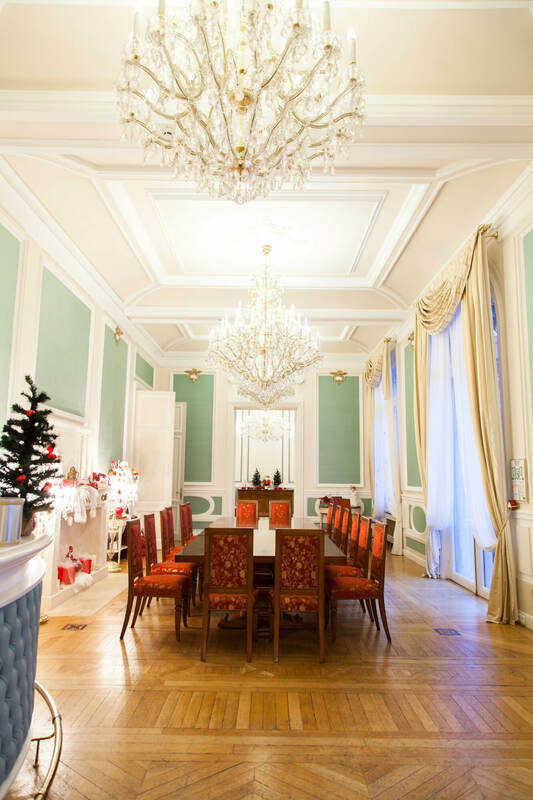 Alternatively, you may be interested in our ability to tie in corporate events at the Château with suitably Christmas-centric activities, as can be instrumental in fostering great relations between your staff on a team-building break or at an end-of-year meeting. Could craft workshops or holiday cookie decorating with our chef help to bring your employees together more than anything else during their time with us? When you wish to hold a corporate event to remember at a time of year that should always be looked back on for the fondest of reasons, there can be no site more impressive, suitable or magnificent than Château Bouffémont. It is on such a note that you may also wish to consult Adestra’s guidance as to how you can make your own festive corporate event a thoroughly unforgettable one.